Soil erosion from wind and water is a natural process. The process of water erosion is responsible for forming and shaping many of our hills and mountains, the gullies and gorges and rivers. Water erosion starts when a soil particle is dislodged from other soil particles and becomes suspended in the rainwater – this usually happens when a rain drop directly impacts the soil surface, or when fast flowing runoff passes over bare soil. Smaller particles, such as clays can stay suspended in water for long periods of time and will be transported as water runs over a slope. As water moves downhill it will take the shortest route down the slope, often gaining speed and energy as it does so. The energy associated with the water moves down the slope will dislodge more soil particles and form narrow channels (or rills) on the soil surface. The formation of rills concentrates the flow (and energy) of the water which accelerates erosion. As these rills become deeper and wider they form gullies and distinct channels. Several factors play a role in water erosion. Rainfall intensity and duration obviously are important, as are the type of soil and whether it is on a slope or not. The harder it rains the more energy it will have to dislodge soil particles. Increasing the amount of rain increases the likelihood of erosion. Due to their make-up (such as size of the particles) some soils are naturally more prone to erosion than others. Soils on slopes are naturally more prone to erosion than soils on flatter land. The length of the slope is also important. Runoff from longer slopes can gain speed and thus energy as it flows down the slope and increase erosion. Place your mouse over the the image below to see the difference between a typical Lesotho stream before rain & after rain. Notice not only the volume of water but also the colour, with the brown water after rain showing the soil which has already been eroded from fields further upstream. In many cases there is not much that can be done to eliminate erosion. Erosion can be dramatically reduced by protecting the surface of soil and by slowing down the energy of runoff as it moves on the landscape. Plants or plant residue on the soil surface, form a natural barrier between raindrop impact and the soil and thus reduce erosion. A rule of thumb is that erosion from a soil with only 30 to 50 percent cover will be up to 80 percent less than a bare soil. Increasing the amount of cover reduces soil erosion. Plants or plant residue also form physical barriers to runoff and will slow down the rate of water movement. Why is Soil Erosion a Problem? 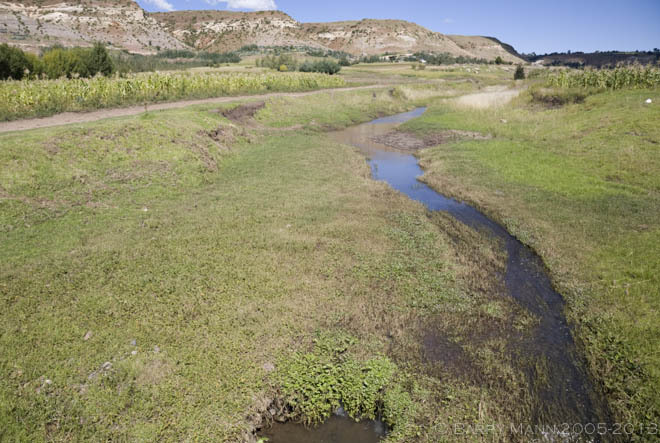 Soil erosion can be a serious problem for the farmer who loses their soil and for the people who use the water and fish in the river down stream from the farmer. In some parts of the world, the impact of soil erosion can even reach as far as the coast and the sea. Soil is one of the most important natural resources farmers have. Without soil farmers cannot farm. As with other important resources it is vital that they are protected or improved for the benefit and sustainability of future generations. Once soil leaves a farmers field it is gone forever. As soil erodes from farmer’s fields, the most valuable part of the soil (the top soil) is lost. The top soil typically has more organic matter and more plant nutrients than the soil deeper in the soil profile. Associated with the organic matter are billions of soil micro-organisms. Micro-organisms are the “engine” that keeps a soil alive and productive. Numerous scientific studies have shown that a soil with fewer micro-organisms or a lower diversity of micro-organisms is less productive than soils with a good balance. Erosion can be made more severe due to man’s influences. Understanding the factors that influence soil erosion help us to understand things we can do to reduce or even reverse soil erosion processes. 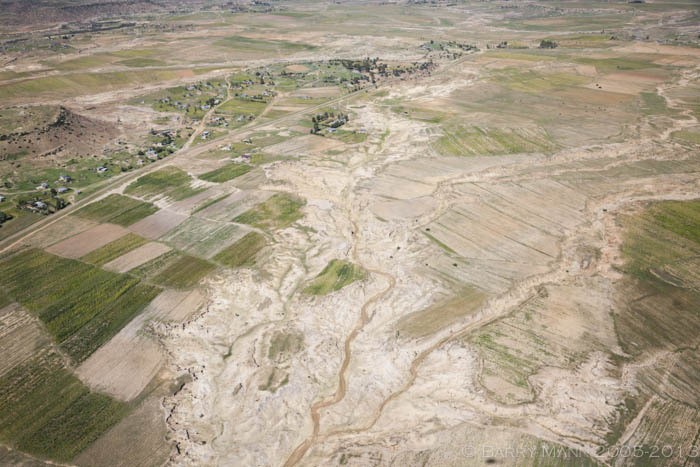 Erosion can be a great problem for people living “downstream” from the eroding fields. Too much sediment can alter the ecosystem of streams and rivers, changing the delicate balance of the plants, fish and animals that live in the water. The nutrients from the eroded soil can stimulate the growth of plants in the water. If there are too many nutrients in the water plant growth can be excessive. When these plants die and decompose oxygen levels in the water will be reduced, making the water uninhabitable for some fish. In some cases this can cause fish kills. 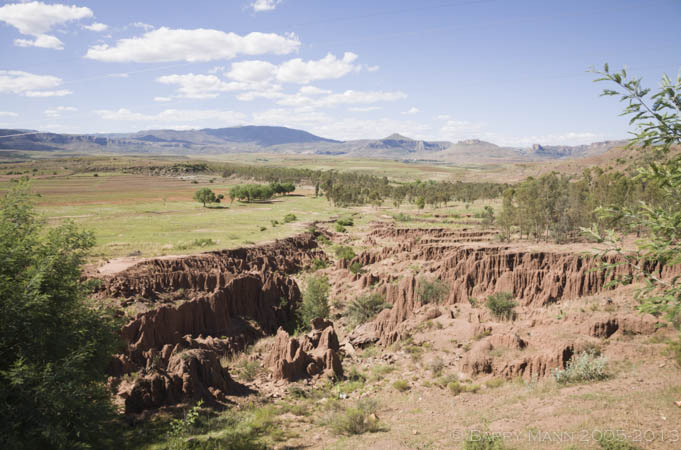 Soil erosion caused by the plough and over-grazing is severe across Lesotho and the different stages of erosion in fields over time can be seen in the images below.